When I tell people I run a website about Forex trading, generally the first thing they ask me is ‘What is Forex?’. Well Forex stands for Foreign Exchange. Many of you will have come across Foreign exchange in your travels or when purchasing goods from another country. If you have ever gone on holiday to a foreign country you have probably had to exchange your normal everyday currency into the currency of the country you’re visiting. If you visit the foreign exchange desk at the airport or travel agency to exchange money up, you will likely notice that the dollar in your hand is worth different amounts of foreign currency. This is because major currencies float freely against one another with their prices changing based on various different factors. By changing your money up into a different currency, you have partaken in the foreign exchange market albeit in a very small way. While a number of participants like our tourist simply want to exchange money into another currency. For example, multinational companies often have to exchange significant amounts of money in order to pay wages and other expenses in foreign countries where they operate. Other participants in the Foreign exchange market aren’t there to exchange currency, but rather to speculate on movements in price. These currency traders try and make profit off even small fluctuations in currency prices. Currencies are traded against one another, with each pair constituting an individual instrument. Currencies pairings are typically listed in the following way; AAA/BBB. The names of different currencies are reduced to three letter codes published by the International Standards Organization. For instance the three letter code for the US Dollars is USD and the three letter code for the British Pound is GBP. While it is easy to guess what many of these codes stand for some of the codes given out by the International Standards Organization are less obvious. Take for example the three letter code given for the Swiss Franc which is CHF. Thankfully a full list of these codes can be found on Wikipedia. Currencies are quoted in pairings, with the most traded currency pairing being the EUR/USD. If the price quoted for the EUR/USD is 1.32071, this means that for one Euro you would get a total of 1.32071 US Dollars in exchange. So if you bought the EUR/USD and the quoted price rose to 1.33071, you would have made one cent for each Euro bought. It is in this way that currency traders make money from trading Forex. Obviously there is also the potential to lose money if in our fictional situation the quoted price for the EUR/USD fell to 1.31071, the currency trader would have lost 1 cent for each Euro he or she bought. 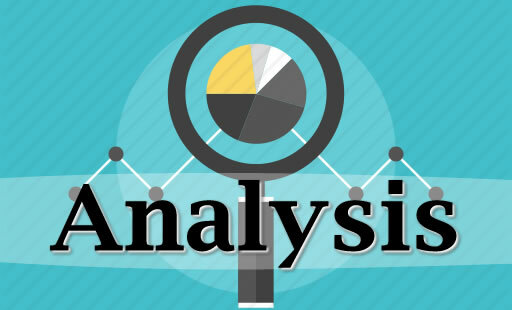 The foreign exchange market differs from other financial markets in a number of different ways. Firstly there is little to no inside information, with currency prices usually being determined by actual monetary flows and various macroeconomic factors. Price sensitive news is released publicly and theoretically everyone in the world could receive this news at the same time. Forex also differs from stock and futures trading as there is no centralised exchange responsible for handling trades. Instead Forex is an interbank, over-the counter market which means there is no single exchange for each currency pairing. This in turn means that the Foreign exchange markets trade 24 hours a day throughout the working week. The Foreign exchange market opens at 10pm GMT Sunday night and doesn’t close until 9pm GMT Friday night. This means all the global currencies can be traded continuously during the week, allowing traders to react to news as it happens rather than waiting for the exchanges to open. 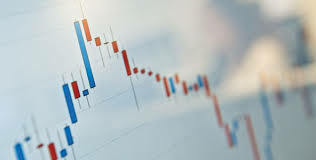 This is also what makes the Foreign exchange market very attractive to individual traders as the 24-5 nature of the marketplace allows them to trade around their job and other commitments. The Foreign exchange market also happens to be the world’s largest financial market. The average daily trading volume is estimated by $5.0 trillion dollars (of which spot Forex makes up $1.5 trillion dollars). It is hard to understand quite how big the Foreign exchange markets are without comparing them to other large financial markets. The New York Stock Exchange (NYSE) is the world’s largest stock exchange and has a trading volume of only $22.4 billion dollars a day. The London Stock Exchange (LSE), Europe’s biggest stock exchange has a daily trading volume of $7.2 billion dollars a day. This means that the Foreign exchange markets are highly liquid with plenty trading opportunities for shrewd traders. 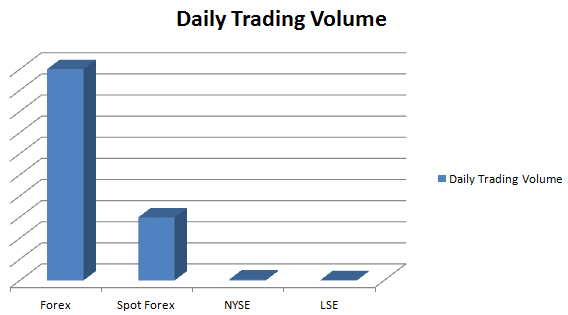 The size and 24-5 nature of the Foreign exchange markets makes Forex trading very popular with individual traders. As it allows them to trade around their other commitments which is often not possible with other forms of financial trading. 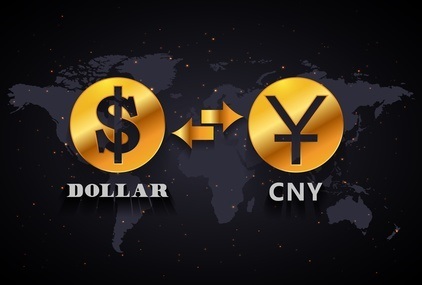 With international trade increasing year on year, it seems very likely that the Foreign exchange market will maintain its place as the world’s biggest financial market. This means that Forex is likely to remain one of the most popular forms of financial trading for individual speculators.